Published Nov 15, 2018 By Julia Leave a CommentThis post may contain affiliate links. 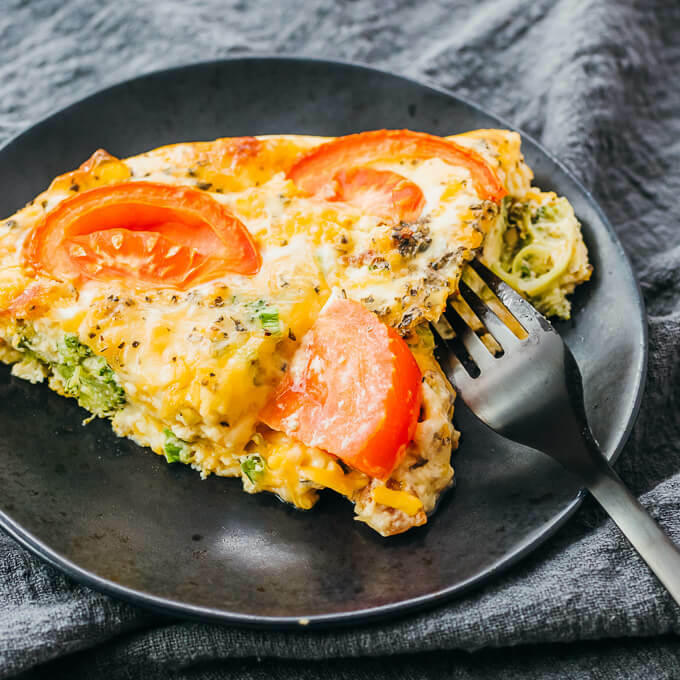 This crustless quiche is filled with broccoli, cheddar cheese, bacon, and tomatoes — a low calorie, low carb, and keto recipe that’s easy to make, whether for breakfast or for dinner. Adapted from my quiche lorraine recipe, it’s very similar in taste and texture. 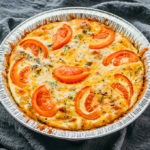 This crustless quiche is adapted from my quiche lorraine recipe; both pies have crumbled bacon, sliced tomatoes, shredded cheese, and dried basil. 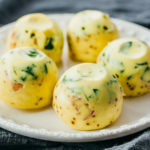 Their liquid base is a mixture of eggs and milk. Both quiches have a gorgeous presentation and a delicious silky texture. The main difference is the lack of crust, and the addition of broccoli florets, sliced scallions, and cheddar cheese. I don’t miss the crust because all of the flavors are in the filling, not the crust. The slices hold up well by themselves, without a crust for support. Use a disposable foil pie dish to reduce cleanup. When greasing the dish, use a nonstick cooking spray which only takes seconds to apply. Buy ingredients that come in the desired quantities, so you can skip the measuring step. Often shredded cheese will be packaged in 8 ounce bags, and evaporated milk is frequently sold in 5 ounce cans. Buy pre-cut broccoli florets so that you can skip the chopping (and usually you can microwave the broccoli directly in the package). Buy pre-cooked bacon bits so that you can skip the frying step. The only real work you have to do is assembling the quiche. After that, the oven can take it from there. 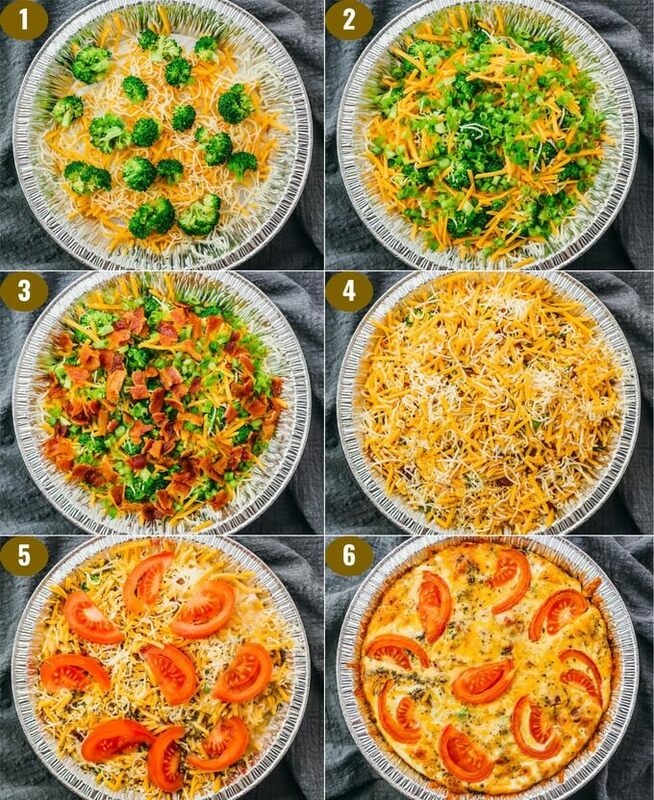 Without the crust, quiches are generally low in carbs since only eggs, dairy, vegetables, and meat remain. 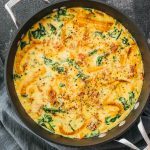 In this recipe, bacon has zero carbs, and scallions, eggs, basil, and cheese have very few carbs. Broccoli, tomatoes, and milk are the most carb-dense ingredients, and they’re used in moderation so that the overall carb count per serving is low. Each serving size is one quadrant or one-fourth of a pie, which comes out to 350 kcal and 6g net carbs apiece. I like how this recipe uses a 5 ounce can of evaporated milk as opposed to regular milk. 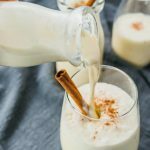 Most people on a keto diet don’t keep milk regularly stocked in their refrigerator, so using a once-and-done ingredient is preferable to buying a jug of milk that you’re only going to use a small amount of. Replace the cheddar cheese with any kind of soft shredded cheese, such as pepperjack or mozzarella cheese. Replace the broccoli with other vegetables like zucchini, asparagus, bell peppers, or mushrooms. Just make sure they’re pre-cooked or else they’ll release too much liquid into the quiche during baking. Replace the bacon with leftover ham or chopped prosciutto. Replace the basil with other dried herbs like oregano, thyme, or rosemary. 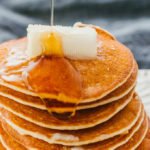 It’s a relatively forgiving recipe, so you can easily make adjustments to the various ingredients to suit your preferences. Enjoy! 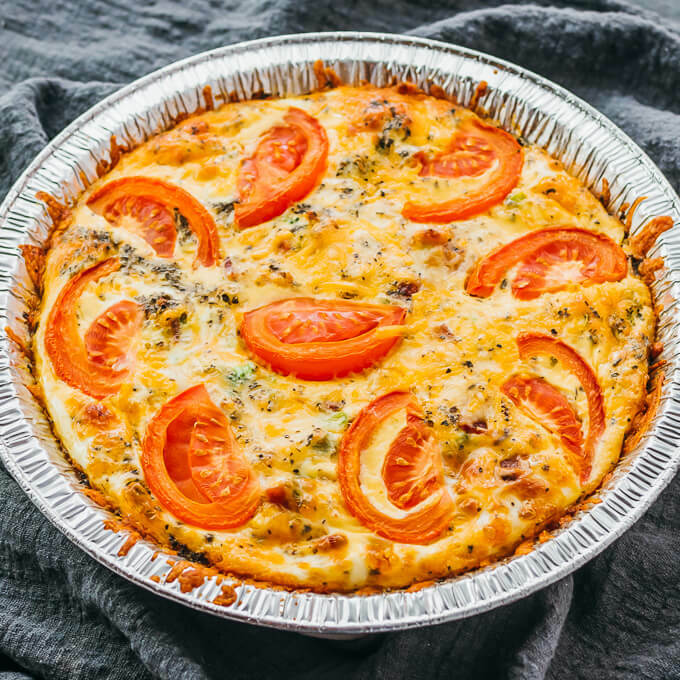 A crustless quiche filled with broccoli, cheddar cheese, bacon, and tomatoes; similar to quiche lorraine. Low carb, keto, and gluten free. Preheat the oven to 350 F. Grease a 9-inch pie dish. Microwave the broccoli until tender, a few minutes, and drain on paper towels. Microwave the bacon strips according to package instructions until they're crispy, about 5 minutes. I recommend microwaving them with paper towels to absorb the grease. Alternatively, pan fry them. When cool, crumble into small pieces. Scatter about 1/3rd of the shredded cheese over the pie dish. Evenly distribute the broccoli on top. Scatter another 1/3rd of the cheese. Evenly distribute crumbled bacon and scallions on top. Scatter remaining 1/3rd of the cheese over the pie. In a bowl, beat together milk, eggs, basil, and pepper. Pour over the pie. Decorate the top of the pie with sliced tomatoes. Bake the pie at 350 F for 40 minutes. Let it cool for 15 minutes before cutting into it. This recipe yields 6 g net carbs per serving (1/4th of a pie).